Fermented foods become increasingly popular, mostly thanks to their healthy image. Indeed, with growing knowledge on the gut microbiota, we discover that fermented foods may treat and prevent from obesity, cancer, osteoporosis, and mental health disorders. But how much do you know about fermented foods? Fermented foods are the result of the conversion of raw foods by microorganisms into new foods. Fermentation is a quite old process. Human beings have been eating fermented foods for 10,000 years. At first, the goal of fermentation was to improve the shelf life of a product. But it also enhances taste, structure and nutritional quality. Fermentation matters a lot in shaping the final taste. This process provides a remarkable range of unique flavours that cannot be found otherwise. Do all fermented foods contain living microorganisms? Not all fermented foods contain live organisms. Some products, such as beer and wine, undergo steps which remove microorganisms. Even if they are not taken away, these microorganisms can be killed by heat treatments. Thus, many fermented foods do not contain live microorganisms. Still, some of them show health benefits without live microorganisms, such as coffee, chocolate and wine, which are rich in antioxidants that improve heart health. Only few of the fermented foods have probiotic activity. Yogurt, kefir and fermented dairy foods with added probiotics are fermented foods with probiotic activity. What are the benefits of fermented products? Not all fermented products have shown beneficial effects on health. It will depend on the presence of living ferment and the type of ferments provided by the products. Studies show that fermented products with probiotics can influence the gut microbiota or microbiome, leading to potential health benefits. The gut microbiota is famous for its extraordinary abundance in different microorganisms. Probiotics can foster some species that modulate your metabolism and therefore promote health. Because of their healthy effects, modern fermentation techniques can add probiotics and prebiotics in fermented products in order to increase their benefits. The WHO (World Health Organization) defines probiotics as ‘Live microorganisms that, when administered in adequate amounts confer a health benefit on the host’. That is to say, probiotics can be called such, only after they are characterized and provide clinical evidence of a health benefit. That is why not all fermented foods are probiotics. Probiotics can be found in fermented foods, among which are fermented dairy foods, and in probiotic-fortified products. Prebiotics should not be confused with probiotics. The International Scientific Association for Probiotics and Prebiotics (ISAPP) defines prebiotics as “a substrate that is selectively used by a host microorganism to produce a health benefit”. Most of the time, prebiotics are non-digestible fibers, that will induce the growth or activity of beneficial microorganisms such as bacteria and fungi already present in the gut microbiome. Among dairy products, what are the different fermented food? What are the health benefits of fermented dairy products such as yogurt? Did you know that in a single cup of yogurt holds 108-10 viable bacteria? Actually, yogurt and fermented milks are amazing sources of live bacteria. Yogurt, to be called so, must contain both living Lactobacillus bulgaricus and Streptococcus thermophilus. And these bacteria appear to be worth of interest. 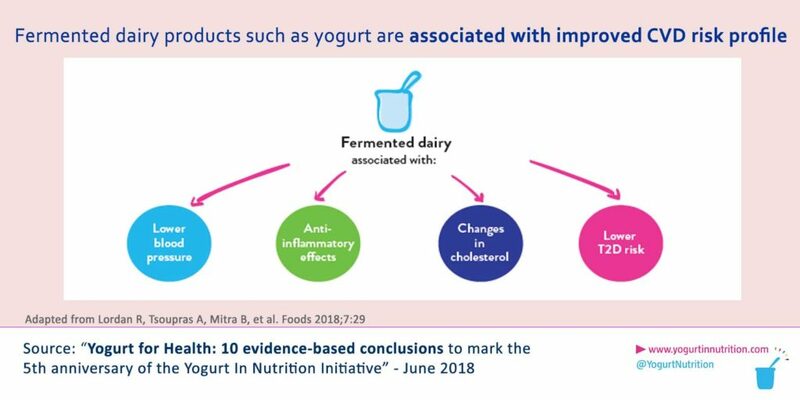 Yogurt, with its live cultures, can contribute to gut health. And in the short term, eating yogurts can make you feel good by raising levels of serotonin. Serotonin is a neurotransmitter that modulates our mood. And high levels of serotonin are linked to well-being. What’s happening in your gut when eating yogurt or fermented milk? The gut microbiota plays an important role in keeping us healthy. Researchers say the healthy effects probably come from the beneficial end products of some microorganisms once they reach the gut. 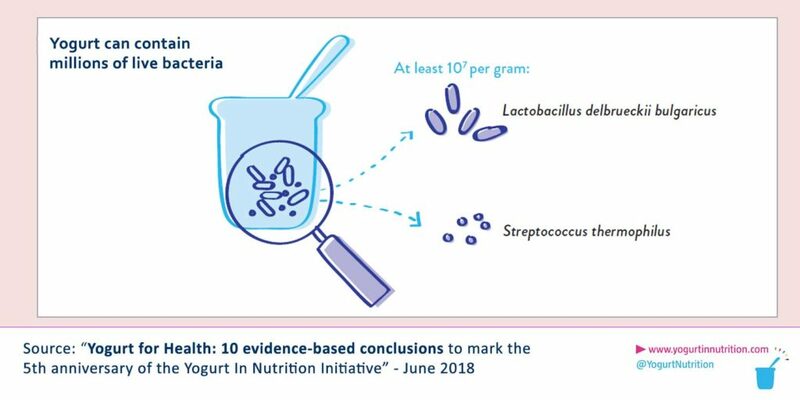 The most famous microorganisms involved in the process are the yogurt culture starters Streptococcus thermophilus and Lactobacillus delbrueckii subsp. Bulgaricus. Strains of Bifidobacterium and Lactobacillus can also be mentioned for their probiotic features. While fermenting, the lactic acid bacteria (LAB) generate bioactive metabolites such as peptides. There are several peptide types. For instance, some are anti-microbial, they can kill other species of bacteria or prevent them from multiplying, and they are called bacteriocins. Therefore these peptides modulate the gut microbiota. LAB are commonly used for dairy fermentation. Bioactive peptides produced by LAB are delivered when proteins break down, whether it happens throughout milk fermentation or in the gut. Yogurt-type peptides are worth mentioning since they have anti-inflammatory effects that are greater than those of any other dairy product. What’s left to know about fermented foods? It is now agreed by researchers that microorganisms leading fermentation are responsible for the effects of fermented foods. Meanwhile there is probably a lot more to learn about fermented foods. Research now focuses on the links between gut, microbiota and brain. The goal is to discuss if and how probiotics and prebiotics could affect our behaviour. A lot remain unknown regarding the way microorganisms are delivered in our body, that is to say the “food matrix”. That’s why the relationship between the food matrix, the survival of bacteria and the way bacteria protect our health, is also investigated. A yogurt a day, keeps the doctor away! Fermented dairy matrix: do live bacteria have a role? How yogurt can help you feel good?